Typically, photograph scanners are flatbeds, and batch photo scanners come with attachments that allow for the batch scanning itself. Epson’s $1,000 Perfection V850 Pro Photo Scanner comes to mind as a good example. Epson’s FastFoto FF-640 is a little different in that it looks and behaves much like a document scanner, but it’s designed to batch scan photos. For the most part, it works as advertised, but the batch scanning software is short on versatility. We like it overall, but Epson has some updates to do on the software. As mentioned, it looks like a semi-upright document scanner with a 30-photo (or 80 document sheets) single-pass, auto-duplexing automatic document feeder (ADF). What all that means is that both sides are scanned simultaneously, instead of one side at a time. Not only is single pass faster, but it has less moving parts and the overall paper path is shorter, meaning that it’s less likely to fail. At 11.8 inches wide by 8.7 inches from front to back by 8.1 inches high and weighing 8.8 pounds, it’s about average in size and weight for a document scanner, and it has no real control panel to speak of—just a few buttons and status indicators. In addition, according to Epson, FastFoto is constructed of special handling sheet, custom rollers, and paper path to accommodate fragile photos. What we can say to that is that of the hundreds of photos we scanned during our testing, none were damaged. 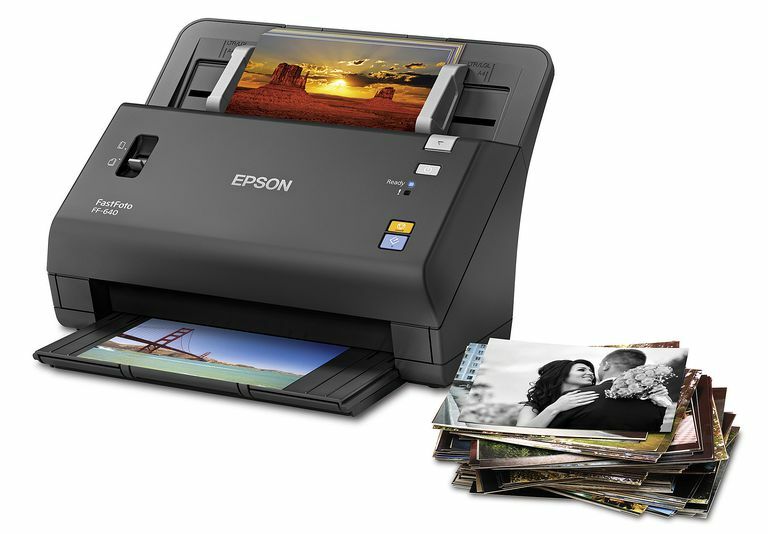 Another feature worthy of mention is what Epson calls “single step technology,” referring to the machine’s ability to scan both the photos themselves and the notes on the back, allowing you to keep that critical identifying data with the photos. Epson claims that you can scan 4-by-6 inch photos at 300 dots per inch, or dpi, at the rate of one per second, which is about what we got, and when we scanned at 600dpi, it took about three times longer. Yes, this is a fast clip, but that’s just the scanning itself; the software waits to process the scans until the batch is finished, and that takes quite a bit longer. It’s also a pretty good document scanner, with rated speeds of 45 pages per minute (ppm) in simplex (single-sided) mode and 90 images per minute (ipm) in duplex (two-sided) mode. While we got close to that a few times, it really depended on what we scanned how fast things went, but overall this is a reasonably fast scanner, and as you’ll see shortly, it comes with the necessary software to process your document scans. Paper, or original, handling is all done by the ADF, of course. We were able to load photos of multiple sizes ranging between 2.2 inches up to 8.5 x 120 inches (of course we don’t have any photos that big; that aren’t already digitized, that is—we’re talking documents here, of course). We compiled some stacks of 3-by-5s and 4-by-6s that the ADF handled quite well. Even so, Epson’s (and all other scanner makers’) claims that you can throw just any old size into the mix and the machine can compensate, is exaggerated, but you can get a reasonably mismatched stack to work. It’s probably not a good idea to try, say, small photos (4-by-6 and lower) and full-size (8.5-by-11, or letter size) in the same batch. The bottom line is that simplicity is the prevalent feature here, so much so that, as you’ll see momentarily, to the exclusion of some key productivity and convenience features. Even so, that doesn’t negate the quality with which FastFoto scans your photos, with dpi’s up to 1,200. Granted this isn’t a prepress drum scanner with resolutions off the chart, but it’s more than adequate quality wise for most photo scanning and restoration projects, especially if most of them will be viewed from some kind of computing device. What impressed us most was Epson’s generous software bundle. Something that always concerned us about scanners designed to digitize the family’s photo accumulation is, what happens when all the photos are scanned? In most situations, the humans in this equation have moved on to digital photo capturing devices. The good news here is that FastFoto is also a reasonably capable document scanner, primarily due to the optical character recognition software Epson has included. We’ll talk about that, as well as some key elements in the bundle, but let’s start with a list of what’s on the disc. Epson Scan: Of the scan interfaces bundled with scanners and all-in-one printers, Epson Scan has always been a favorite. It allows you to tailor the interface to your level of scanning skills, or perhaps restrict higher-end features from employees. In any case, it’s a fine interface. Document Capture Software: This speaks for itself, doesn’t it? Document capture software digitizes and saves scanned documents. Coupled with OCR software, it provides highly productive text capture and conversion abilities. Epson FastFoto with Smart Photo Fix: This is the engine, if you will, that processes the photos once they’ve been scanned, where you set your scan and batch parameters. We’ll talk a little more about this in a moment. ABBYY FineReader OCR: ABBYY FineReader OCR is one of the finest products in its category for either simply digitizing text or for converting it to editable MS Word or Adobe PDF formats. If you start with clean text documents, our experience is that most of the time the results will be 100 percent accurate. Can’t beat that. Most of the software applications in this bundle, aside from the actual FastFoto with Smart Photo Fix program, have been around for years. They’ve been groomed and tailored into fine programs over that time. The FastFoto program is somewhat new, and, well frankly it’s not very well-developed; it’s missing some key features in especially the batch functionality portion. There’s no versatility. Say you want to auto-enhance certain photos within the batch… you can’t. You must allow the software to auto-enhance every photo in the batch, even if they don’t need it, which, as you can imagine, ruins images that don’t require correction. At the least, you should be able to prompt the software for each scan as to whether you want a filter or some other process applied. Of course, you can always arrange your photos into batches with similar needs, but that seems like a lot of additional work—especially considering how smart imaging software has become over the years. Furthermore, the software is unforgiving in that there’s no way to make sometimes important changes within completed batches. While these are for some serious, perhaps even deal-breaking shortcomings, Lifewire.com can say with some confidence that, since I’m not the only journalist to point out these issues, that Epson is well aware of them and already in the process of fixing the program, although from a non-programmer’s perspective, it seems like a significant amount of work. The idea is to automate the process as much as possible. Obviously, Epson was shooting for simplicity, but as CNET pointed out, it’s a little too simple. If you’re new to the batch photo scanning game, we’re sure there are many things you haven’t thought of, that’s a big part of why we get to do this—you want to know, so we find out. You probably hadn’t considered some of the batch problems just discussed. At this price level, there should also probably be at least a few more filters, such as dust and scratches, perhaps even Sharpen, Auto Tones, and others. If, on the other hand, simplicity—pushing a single button to scan 30 photos lickety-split at good quality—FastFoto can do all that, and again, while Epson hasn’t confirmed it, we think we’ll see a new version of the software before too long. Now that you know what it can and can’t do, think about how much work you want to put into this project, and make your decision from there.